At the confluence of the rivers Ara and Cinca, lies the medieval town of Aínsa, declared Conjunto-historico-artistic early 1970s. 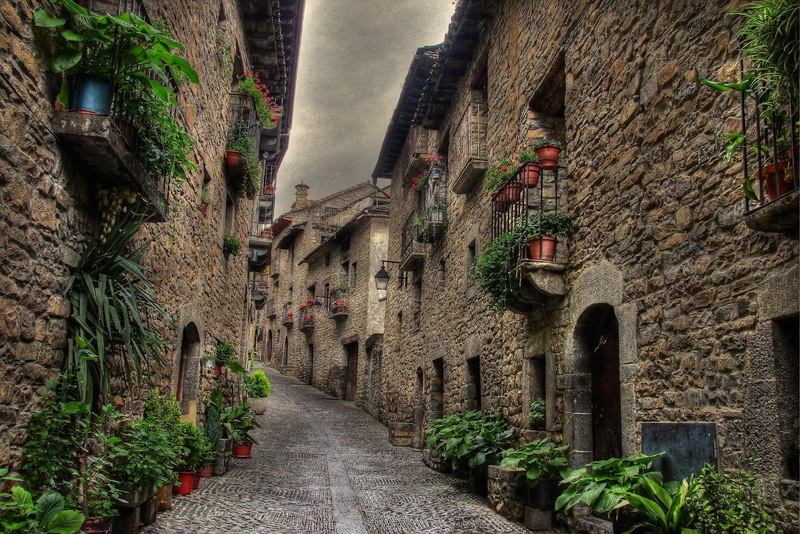 Its strategic location, in the Aragonese Pyrenees, between France, the National Park of Ordesa and Monte Perdido, the Valley of Pineta, the Sierra de Guara and the Valley of Benasque, makes this legendary territory stand by their great wealth of natural and landscape, together with the important traces such as churches and medieval castles that man has left with the passage of time. 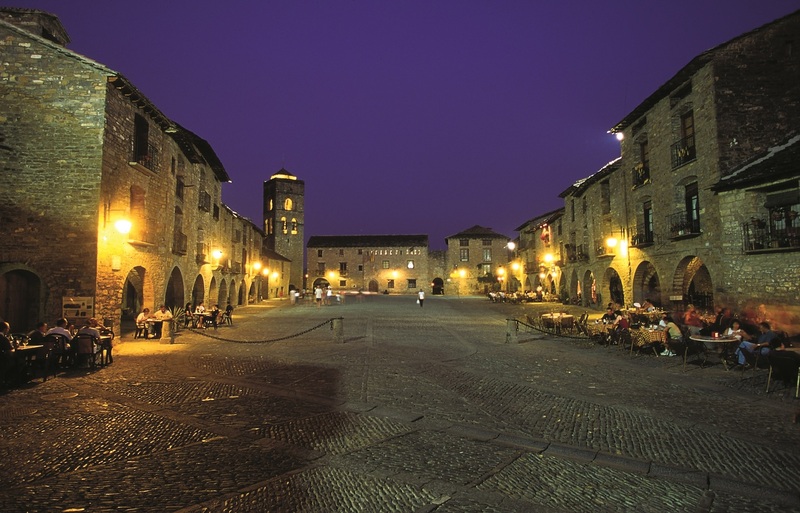 Ainsa has all the services and with an interesting offer to tourist and commercial level. The population consists of two clearly differentiated nuclei, the commercial andmodern part that arose around the junction of roads and the medieval old town. Ainsa day: visit to the historic town of Ainsa. You should not miss the Collegiate Church of Santa María, the cloister, the crypt and the Castle. Enjoy the panoramic views from the balcony of the Plaza San Salvador, both offered as from the walls of the Castle, stroll along the cobblestone streets of the village and the impressive PlazaMayor and finally get carried away by the story told in a different way with theatrical guide that offers us the Encantarias. Museum of traditional arts and crafts in the square of San Salvador. Ecomuseum in the South Tower of the Castle, dedicated to the flora and fauna of the land and especially the species protected of the bearded vulture. Regional office of tourism, the tower north – east of the Castle, where you can gather information and see some of the videos presenting this territory. Office of the Geopark, in the Northwest Tower of the Castle. From the car park of the Castle, you take the road on the right and you follow it without detour, will take you to the cross cover, where rose this monument in honor to the appearance of the cross in the oak which gave victory to the Christians against the Saracen, much appreciated by the ainsetanos place. For the return, you can return to the same site (30 minutes) or a turn complete going towards the Hermitage of San Felices, with this tour, you can contemplate fantastic views of the river Araand Sierra de Partara (60 minutes). Another option is a walk through the Green corridor along the river Ara panels and elements of Ornithology placed therein (45 minutes). Opposite to the entrance to the bridge of the Ara, begins an ascent that leads to the chapel of Los Palacios, place of pilgrimage for the ainsetanos, this climb can make some spectacular pictures of the Villa de Ainsa (1 hour). At the junction before continuing towards the Hermitage, signs, you will enjoy getting to know the signposted paths the route for the Coton Hill where you will enjoymagnificent views of the Marsh with the impressive Peña Montañesa in the background (3 hours) or the path of the Sierra de Partara, where hearings teach us the Valley of Ara to the height between Boltana and Ainsa (4 hours).